“This has got me thinking about what it means to be Singaporean. All these accomplishments and trophies certainly fill me with pride. 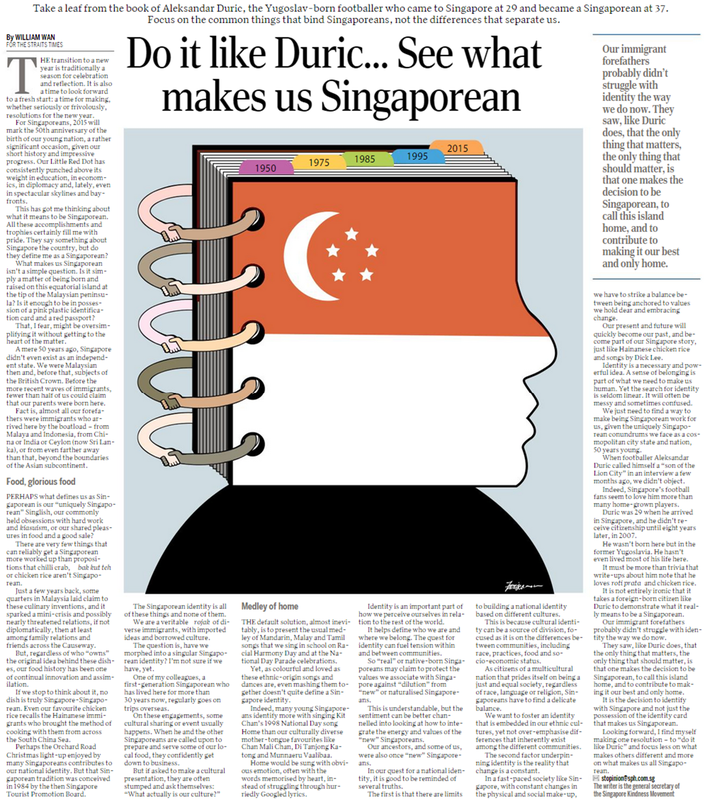 They say something about Singapore the country, but do they define me as a Singaporean?” (Do It Like Duric … See What Makes Us Singaporean, William Wan). Dr. William Wan’s commentary (Jan. 2, ST) on the elusive Singapore identity – and the first of many in this year of celebration – left me nonplussed. He explained that we are “a veritable rojak of diverse immigrants, with imported ideas and borrowed culture”, yet made the obvious concession that we have not “morphed into a singular Singaporean identity”. With his constant allusions of our forefathers as immigrants, and how we have embraced Yugoslavia-born footballer Aleksandar Duric, perhaps Dr. Wan was unsettled by the ubiquity of xenophobic sentiments, and hence felt obliged to emphasise our struggle with identity. I am not so sure if we can distil characteristics or markers – especially when many of them have been shaped superficially by the state – which define us as Singaporeans. And I am even less convinced by his conclusion to “focus less on what makes others different and more on what makes us all Singaporean”. The motherhood statement seems like the obvious cop-out, because we still have no clue about these common things which supposedly bind us, and reduces the discourse to a dichotomy of should-be’s and should-not-be’s. Maybe it is this grandiose, meaningless chase for an identity which blinds us to the diversity Singapore is home to. Maybe it is this grandiose, meaningless chase for an identity which blinds us to the diversity Singapore is home to. Points of difference that Dr. Wan has resolved to shy away from. I think the growing interest in human interest stories on the Internet and in the mainstream media is no coincidence, since these narratives embody not only personal endeavours, struggles and triumphs, but are often representative of challenges to entrenched norms. Beyond tales of rags-to-riches, it is the individual who has succeeded through a non-academic route, the individual moving to a non-profit after years of nine-to-five routines, and individuals making a difference through small gestures, musings, or campaigns. One could argue that personal ambitions and identities in the past were shaped by state-directed master-plans, whereas personal aspirations or lived experiences of the present and future are more likely to influence our policies. Moreover, the proliferation of these varied narratives means they are no longer reduced to mere vignettes at the National Day Rally. Do I always identify with these stories? Not necessarily. But reading about their undertakings and circumstances, in a way, provides unique points of connection which enrich me as a Singaporean. As a 23-year-old I have no grand presuppositions of what makes our identity. Singapore is my home, and as long as we hold close those dearest to us, look towards the next 50 years with a bigger heart – even without an “identity” – I believe we will do alright.